OBJECTIVE: Create a digital marketing campaign with Adroll (similar to Google’s platform for online marketing). Sell a lot of tickets; Grab attention in the competitive arts market of Washington, DC; communicate the plot of the play and generate intrigue. SOLUTION: We developed a huge campaign of vivid and attention-grabbing banner ads (30 web banners in all). We ensured that all digital marketing mirrored the print campaign (poster, postcard, business card, and program). We set up our online advertising campaign so that our banners would appear in the browsers of those who have purchased tickets to a theatre event in the past year and those who have visited a participating theatre’s website. 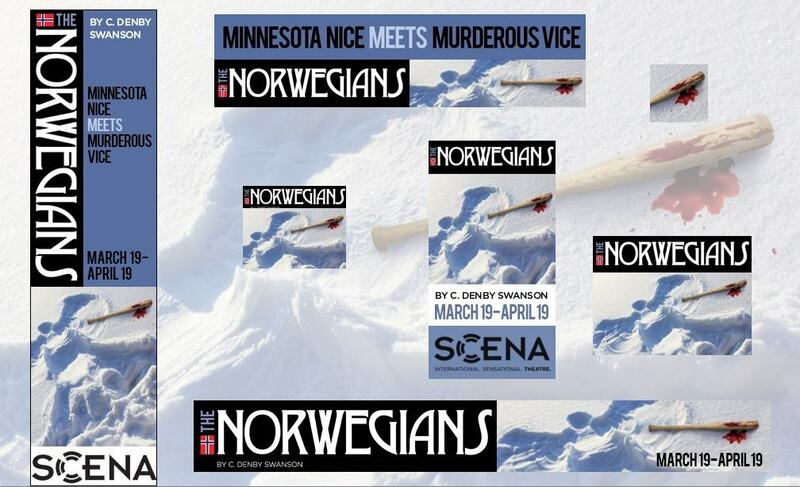 EXECUTION: The plot of The Norwegians revolves around “really nice hit men” of Nordic decent who live in Minnesota. This graphic captures the sinner and saint deep inside the two hit men. Our show graphic reflects the frigid, yet sunny nature of Minnesota in winter. And the Norwegian typeface is unique to that part of the world. RESULTS: Ticket sales were up markedly, especially early on. We saw a 30% increase in sales leading up to opening night and a 20% increase during the run of the play. This was a success story for our agency, Dean Creative—a Los Angeles digital entertainment marketing agency.